The 0° rear - comparisons by Panta. What is a zero degree or a dead truck ? 0° means that the angle made by the Kingpin with the ground is 90°, so the bushing seat of the axle is parallel to the ground, the base plate angle is turned to neutral (or dead). It mostly refers to RKP trucks, but not exclusively. With a TKP the kingpin is not passing through the axle by through bushing seats and so the measurement of a TKP at 0° is slightly different. When you have a dead rear, your rear truck doesn’t turn like a front truck - it just leans to the left or to the right, pushing your setup forward as straight as possible without loosing energy. While the front truck is making little sinusoidal (oscillating) curve and pulling, the dead rear is pushing forward. The use of inverted (not reverted, which applies to RKP) truck is recent in the distance community but has definitely changed the game. Like most good things it came about by accident. I met Will Eric in Miami in 2015 and he was riding the first Zero degree set-up I had ever seen - him and his brother Max had a Subsonic Century that has been run over by a car and its tail has been broken. Because of this the only way to mount a truck on the cut tail was to invert the baseplate - The first 0° LDP set-up was born. Andrew Andras was also riding a Century proto set-up of the first voluntarily chopped tail, and after testing it many of us had a revelation - it works, and it works better! A couple of day later I asked Scott Moore, former Subsonic founder and shaper, to shape me a chopped century. Since then, more and more people have started riding the 0° and it has become a must have (even so, some riders doesn’t like it and still ride a more classic 10 to 20° rear, mostly on top mounts ). This revelation also gave ideas to a talented engineer. Some months later, at the Dutch ULTRA 2015, Andrew landed in the Netherlands with the brand new proto of the now famous G|Bomb Torsion Tail. One hundred meters (and a spill) later, i was totally charmed by the Torsion Tail. At the end of the Summer Mark had release a prototype batch of the Torsion Tail v1, pre-sold in a couple of days. It was my first TT. The torsion, as named, works by torsion! The two arms of the fork twist and release energy. So technically it is a not a zero degree truck as there is no lean at all (and no kingpin) - just torsion and lateral moves whereas a classic truck with a vertical kingpin leans. After the v1, 2016 saw the release of the v1.5, an advanced and improved prototype. This cured some of the defaults of the first series and the fragility of the first raw model, correcting some weak points. The v1.5 is the same shape, but with more resistant aluminium alloy who made it much stronger and reliable There was also some slight improvement in the way axle and bushings are set-up which made it much faster. The black v1.5 was the second prototype development incorporating some changes for improved robustness and performance It was a natural evolution of the v1. The juniors of the family were made of steel, more narrow and shorter in length. A much more easy to ride and playful TT. I nicknamed it the 'Urban TT', as it allows more straight and narrow curves, more acceleration, and is lighter. More suitable for an urban ride in narrow streets because of its size. I like to ride it on short to medium wheelbase, on a medium to stiff flex deck, with a shockpad of 3° and small wheels (<75mm). The last and ultimate revision of the Torsion Tails – Made of Aerospace alloy frame. The TT-A is even more pure and effective - the best TT ever made. Stiffer than the other versions it is less easy to initiate but definitely the fastest and most reliable at high speed. I like it mounted with a medium to stiff flex deck, long wheelbase, 85mm wheels, for both pushing and pumping. It is my competition choice, the fastest, lightest, most efficient at high speed. I prefer the v1.5 for daily commute and practice. According to my own tastes and experiences, I prefer the Torsion Tails mounted on a stiff flex board, with a medium to long wheelbase. Better for LDP that for all push, especially for mongo pushers, he has a great stability and keep the set-up very low. I ride it with the the stocked 3° shock pads, i prefer it like that with a slight angle, some riders ride it flat but he is less efficient. 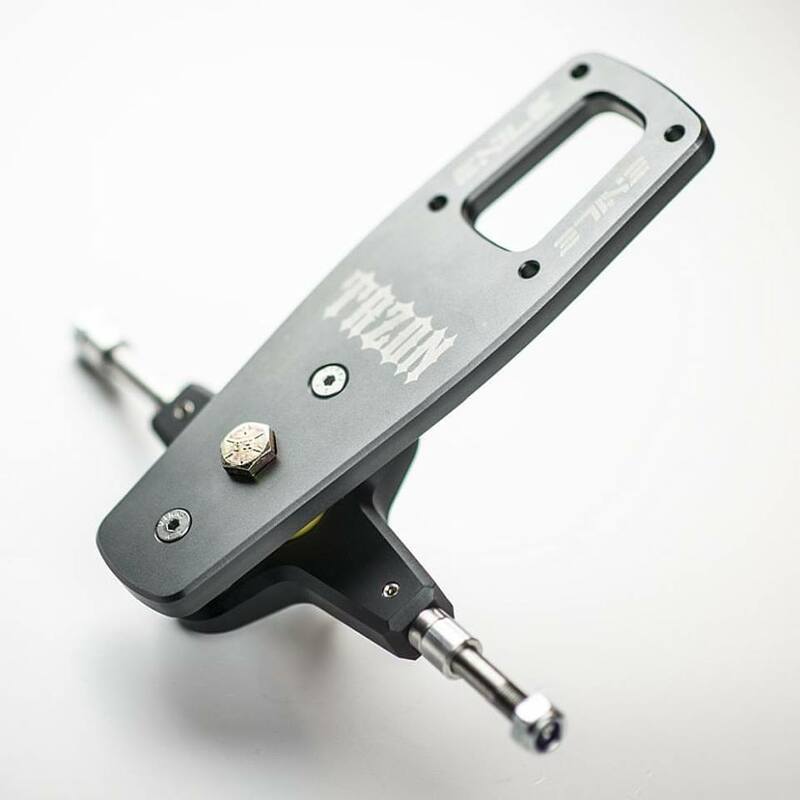 A couple of month after the 2015 release of the first proto of Torsion tail, Don’t Trip create an other revolutionary rear truck - the Delirium - a zero degree truck, a pure one. The Delirium is more simple in design, a long tongue with a king pin to whom a tombstone is attached vertically to hold the Axle. When you have it in your hand, it looks strong and reliable - I have only ever seen one broken Delirium where the tombstone screw had broken. The v2 made some changes. A black anodised frame, adjustable width (125mm-150mm) and the tombstone is 3mm higher - this extra height adds more leverage. The spherical pivot remains the same. I do personally prefer the v1. Slight differences, I feel the v1 more easy to launch. According to my own tastes and experiences, I prefer the Delirium mounted on a stiff to very stiff flex board, with a medium to long wheelbase. More for pumping than for pushing, as it is a bit higher and less stable during a mongo push phase than a Torsion tail. I don’t ride it with riser pads - I prefer it flat, like many riders. Based on a Delirium idea, i have not ridden it enough to make an honest review. The theory is the same that the delirum but with a dual pin. A full carbon frame and a DIY axle and tombstone, in 10mm. A very surfy ride, pleasant and easy, but this prototype was the end of its development. The One Million Dollar question - Which one is the best? It depends! It depends on your style. Are you more fluent? More brutal? Do you race or do you commute? Are you a massive guy or a tiny one? It depends also of your deck, length and stiffness. I can only say that I personally love them all. They are mounted in a different way with different decks for different purposes. I still own most of all of them simply because I can not definitely make my mind if one is really better than the other!